Every viable business depends upon a reliable and affordable electricity supply. In Australia, thanks to its suicidal renewable energy policies, that essential combination is now a relic of history. The chaos and staggering cost of intermittent wind and solar power has sent power prices through the roof and left its grid on the brink of collapse. The authorities and agencies charged by the Federal Government with responsibility of delivering power as and when households and businesses need it, are selling so-called ‘demand management’ as a ‘solution’ to the crisis. By demand management they mean Soviet-era rationing. As the Chinese proverb goes, for every crisis there’s an opportunity. And Australia’s renewable energy disaster has generated an opportunity for the energy rich State of Pennsylvania. The state of Pennsylvania has sought to poach Australian companies with a promise of “abundant” energy, sparking renewed warnings from Australian business leaders that the nation risks losing jobs to offshore rivals unless it tackles its energy problems. A high-powered delegation from the Pennsylvanian government, headed by Dennis Davin, the state’s Secretary for Community and Economic Development, visited Australia seeking out large and medium Australian businesses and plugging his state’s energy advantages. The week-long trip early this month, with stops in Sydney, Melbourne and Perth, included an ­address to the Australian Institute of Energy’s Sydney branch where Mr Davin spruiked energy as the “foundation’’ of Pennsylvania’s economy. The trip came before US President Donald Trump announced a corporate tax package that is also expected to boost US competitiveness. 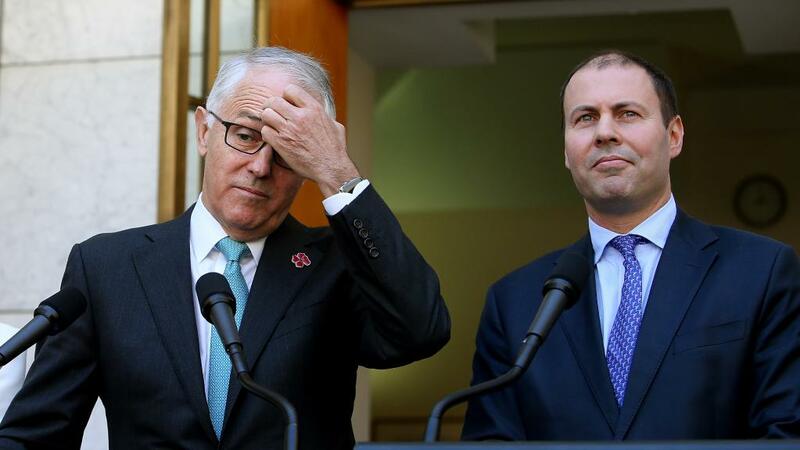 The tour came at the end of a year in which the Turnbull government was forced to intervene in the Australian gas market to ensure there were sufficient supplies for local users who face spiralling prices. Large Australian electricity users are also facing tight supply conditions after the closure of the Hazelwood power station earlier this year. South Australia and Victoria have deployed diesel generators to provide strategic reserves in the event of blackouts and the SA government has commissioned a giant battery to act as a backup. The federal government has proposed a national energy guarantee to provide reliability as well as meeting the nation’s emissions commitments. The Pennsylvanian delegation has fanned fears that Australian firms are considered “ripe for targeting” by offshore rivals with ­offers of low-cost, reliable power. 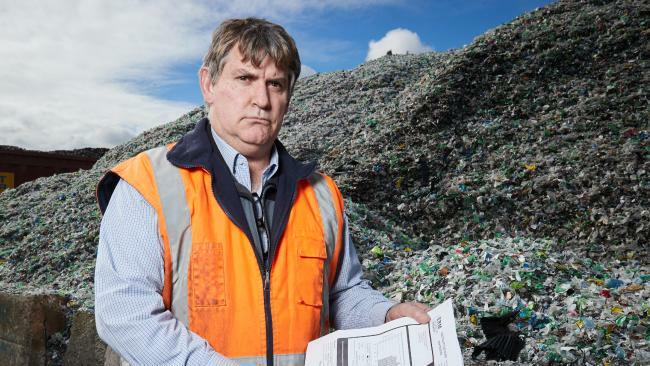 Interim chief executive of the Minerals Council of Australia David Byers seized on the visit. “It’s little wonder that overseas countries are trying to entice Australian manufacturers to relocate by promising low-cost, reliable energy,” he said. 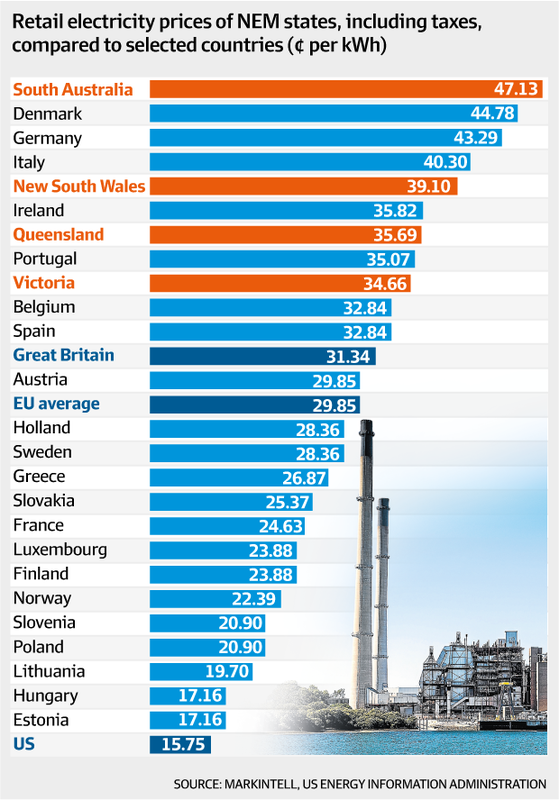 “Over the past decade Australia has moved from having some of the lowest to some of the highest energy prices in the developed world, and, as Goldman Sachs recently noted, wholesale electricity prices are expected to increase by another 20-30 per cent in the medium term. He said Australia had already dropped from 10th to 21st on the Global Competitiveness Index. “Unless serious efforts are made to reduce Australia’s energy costs, we should expect more global attempts to persuade our businesses to relocate, which will be bad news for economic growth and jobs,” Mr Byers said. Australian Industry Group chief executive Innes Willox said the trip by Pennsylvanian officials reflected the new realities of the global economy. “It highlights just how important it is that we have world-leading policy and regulation in areas such as energy so that we can be competitive, ­encourage domestic investment and continue to provide attractive jobs and nurture manufacturing expertise,’’ he said. Promotional material for the delegation says Pennsylvania has the largest unconventional (coal-seam gas) and the second-largest overall gas field in the world which is “generating heat, power, downstream manufacturing and electricity”. Pennsylvania also boasted of having access to nearly 570,000 skilled manufacturing employees in a location only a day away from 40 per cent of the US population and serviced by six international airports, four major railroads, eight foreign trade zones and three ports. Several Australian companies already have a presence in Pennsylvania, including Amcor, WorleyParsons, Chep and CSL Behring. In his address to the AIE, Mr Davin played up Pennsylvania’s position as the largest net energy exporter in the US. It is also second in natural gas production and nuclear power generation, third in energy production and fourth in the production of coal. Promotional material for the AIE appearance said Mr Davin, and deputy secretaries Joe Burke and Sheri Collins were available for confidential meetings with local organisations “seeking to investigate opportunities for collaboration in Pennsylvania”. While energy supply appears strong in Pennsylvania, prices appear to be at the high end of current Australian charges. The average price of electricity per megawatt ranged from $76 to $123 in 2016-17 in Australia while the average commercial electricity rate in Pennsylvania was advertised at about $121.90 a megawatt ($US94.40). The fact that Sid Maher has ended up as a pen-pusher for The Australian, rather than a captain of industry is laid out in his last two paragraphs. Commercial users in Pennsylvania are paying 8.85 cents per KWh, equating to US$88.50 per MWh. Industrial users are paying 6.67 cents per KWh, equating to US$66.70. Depending on the State they’re in, Australian commercial users are paying upwards of A$0.35 per KWh, or A$350 per MWh hour. Nothing like the figures cited by Sid Maher. Sid also overlooks the prices energy hungry users are forced to pay in South Australia whenever wind power output drops on a total and totally unpredictable basis. Miner, BHP Billiton is South Australia’s largest employer, but the way it’s treated by SA’s Labor government you’d think it was public enemy number one. 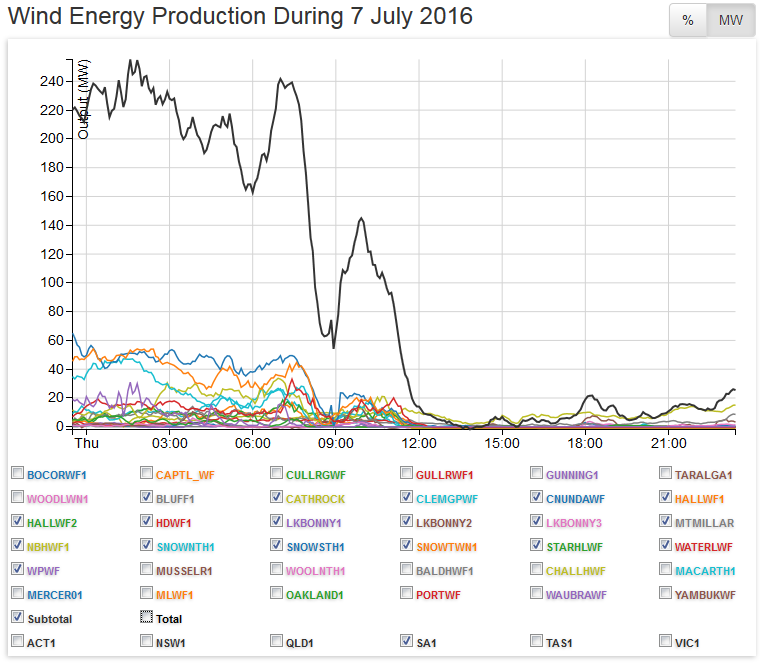 Back on 7 July 2016, a total collapse in SA’s wind power output left BHP with a staggering power bill. 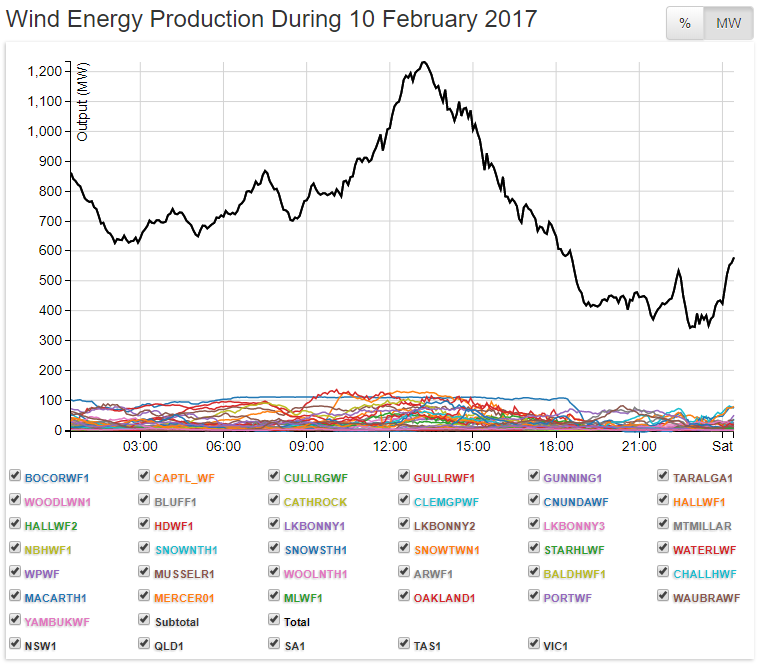 As wind power output plummeted, the spot price rocketed from around $70 per MWh all the way to the regulated market price cap of $14,000 per MWh. That total (and typical) collapse in wind power output cost BHP an extra $2.3 million in daily power costs; causing it’s normal daily power bill to rocket from $250,000 to $2,570,000 (see our post here). The chances of that kind of power market fiasco happening in Pennsylvania are nil. In any event, businesses don’t automatically plump for the cheapest supplier of the inputs they need to deliver the goods and services on which they hope to make a profit. Any hint that those inputs can’t be delivered as and when the business in question needs them, and that supplier would be dumped in a heartbeat. The energy hungry businesses being targeted by the State of Pennsylvania couldn’t care less if the average cost of electricity is equal to, or greater than, what they’re currently paying in Australia. The key factors tempting Australian businesses to shut up shop and head to the US include the fact that in Pennsylvania, those costs aren’t predicted to double in the next two to three years. And, worse still, thanks to its obsession with sunshine and breezes, there are now dozens of occasions when Australia’s energy hungry businesses are unable to procure power at all. In a little over 15 years Australia has gone from having the cheapest and most reliable power supplies in the world, to the most expensive and faces mass load shedding (ie demand management) to keep the entire grid from collapsing. Hmmm… No prizes for picking the cause of the “potential electricity supply shortfalls” on the afternoon of 10 February 2017. By comparison with the insanity that’s gripped Australia, Pennsylvania is still very much in love with its abundant coal and gas reserves. And its nuclear generation fleet provides close to 40% of its total power needs, and yet its consumers enjoy prices that are a tiny fraction paid in nuclear free Australia. So much for the myth about expensive nuclear power. Critically for Australian businesses tempted to move, Pennsylvania appears to have no particular interest in following Australia’s efforts to throw tens of billions of dollars in subsidies to the sun and the wind. Gross natural gas production, primarily from the Marcellus Shale, exceeded 5 trillion cubic feet in 2016, and Pennsylvania was the nation’s second-largest natural gas producer for the fourth consecutive year. Pennsylvania was the third-largest coal-producing state in the nation in 2016 and the only state producing anthracite, which has a higher heat value than other kinds of coal. In 2016, Pennsylvania ranked second in the nation in electricity generation from nuclear power, which supplied 39% of the state’s net electricity generation, more than from any other source. As of 2015, 51% of Pennsylvania households used natural gas as their primary home heating fuel, 22% used electricity, and 18% used fuel oil. Other heating fuels used in the state included propane, wood, and coal. With commercial and industrial power users paying between 7 and 9 cents US per KWh in Pennsylvania, compared with prices north of 35 cents Australian per KWh, the choice for Australian businesses and whole industries is pretty clear. Made even more so by the fact that Pennsylvania doesn’t chop the power to those businesses when the wind stops blowing and call it ‘demand management’. sound of Australian jobs heading to Pennsylvania. Another thing Maher mentioned in the article was that SA had commissioned a giant battery which appeared to suggest is was not yet installed and operational. A bit out of date though as it is already connected to the grid. This of course could simply have been a badly written sentence, nothing unusual with some media stories these days. What use the battery is to prevent blackouts is yet to be truly tested, but what is certain is businesses in Australia will look to anywhere where the supply of energy is at a reliable level, costs of energy can be passed on to customers but not being able to meet orders due to unexpected shut downs making production of orders unreliable, can destroy not only a company’s reputation but it’s very existence. It’s time our Federal and State Governments accepted the experiment with alternative ‘renewable’ energy has failed to meet the needs of Australia’s businesses and those of the people of this once prosperous, efficient and energy reliable country. It’s time they started focussing on what is good for this country and its people and not on what some boneheads existing on dreams and an ideology that’s not of this age, but of an age that’s been well and truly left behind. To try to save the world while destroying it makes no sense. While clean air is something we all wish for, damaging the environment to achieve it makes no sense. Installing massive turbines which some glorify and work toward using large arrays of them to prevent tornado’s and flooding in parts of the USA, by using them to change weather/wind patterns, while at the same time saying they don’t and cannot harm the environment or change weather patterns when placed in rural and regional locations of places like Australia, makes no sense. If it wasn’t so serious this whole situation would and could take on the appearance of a very well written comedy sketch – but this is serious and what is happening makes no sense. So come on our National Political Leader do what you said you would do and look after the people of this Nation, stop the faffing about and start to work for us and this Nations present and future. NOT hard to see why the mainstream (fake news) media and the Left HATE President Trump – supporting jobs and industry with cheap energy and tax breaks! Shock horror! And forget ‘Russian collusion’ these are more than impeachable offences! I say that everyone should encourage Australia to stay the course on their suicidal path to ruin. The only way to kill this monster called Global Warming is to grind economies into the ground. Until the insane green lobby is run out of town on a rail by the people, nothing else is going to stop this madness. This is beyond dreaming – it is a big fat lie. Who pays this bloke? Go figure. A double barrel name doesn’t automatically mean he has double the intellect. His push and shove for the Wind Industry is nothing more than a desire to see his name in print to please the paymaster. Pity he doesn’t understand his name in print only puts him at the top of a significant number of peoples’ ignore list.